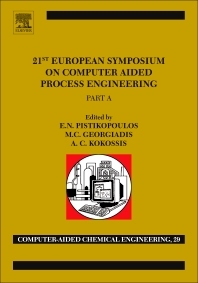 The European Symposium on Computer Aided Process Engineering (ESCAPE) series presents the latest innovations and achievements of leading professionals from the industrial and academic communities. The ESCAPE series serves as a forum for engineers, scientists, researchers, managers and students to present and discuss progress being made in the area of computer aided process engineering (CAPE). European industries large and small are bringing innovations into our lives, whether in the form of new technologies to address environmental problems, new products to make our homes more comfortable and energy efficient or new therapies to improve the health and well-being of European citizens. Moreover, the European Industry needs to undertake research and technological initiatives in response to humanity's "Grand Challenges," described in the declaration of Lund, namely, Global Warming, Tightening Supplies of Energy, Water and Food, Ageing Societies, Public Health, Pandemics and Security. Thus, the Technical Theme of ESCAPE 21 will be "Process Systems Approaches for Addressing Grand Challenges in Energy, Environment, Health, Bioprocessing & Nanotechnologies."